1 of 4 Heat oven to 425 degrees . On one side of a rimmed baking sheet, toss celery root with 1/2 tbsp oil and 1/2 tsp salt. 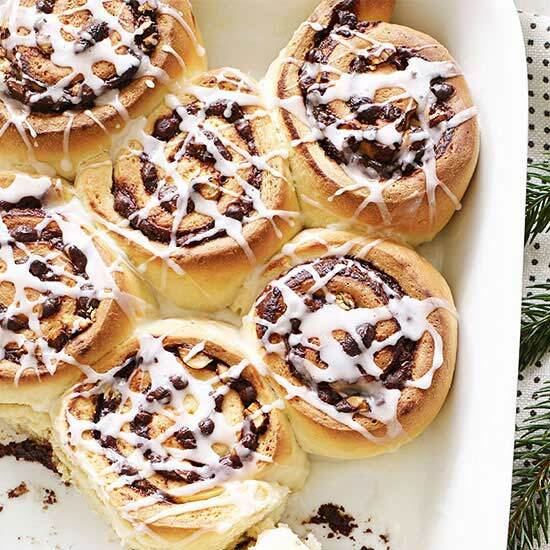 On a sheet of foil, toss apple wedges with 1/2 tbsp oil and 1/4 tsp salt. Roast celery root 15 min. Remove from oven, add foil with apples to baking sheet and roast 10 min more. 2 of 4 Meanwhile, pat pork dry. Sprinkle all over with 1/4 tsp each salt and pepper. 3 of 4 Working in 2 batches, heat 1 tbsp oil per batch in a large stainless steel skillet over high. Add pork and cook, turning once, 7 to 8 min, until golden brown and temp reaches 140 degrees . Transfer to a plate to rest 5 min. 4 of 4 Return skillet to stovetop over low heat. Carefully whisk in flour, then broth, stirring to scrape up browned bits. Stir in thyme and 1/8 tsp salt. Taste, and adjust seasoning if needed. 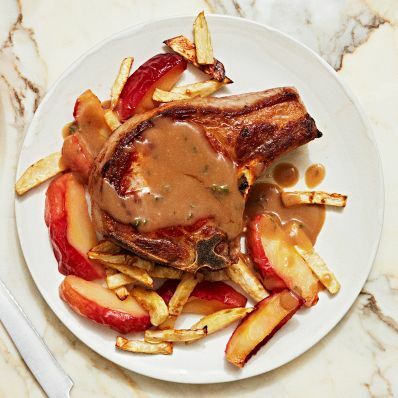 Serve pork with celery root, apples and gravy. Per Serving: 28 g carb., 5 g fiber, 28 g Fat, total, 5 g sat. fat, 496 kcal cal., 892 mg sodium, 13 g sugar, 34 g pro.